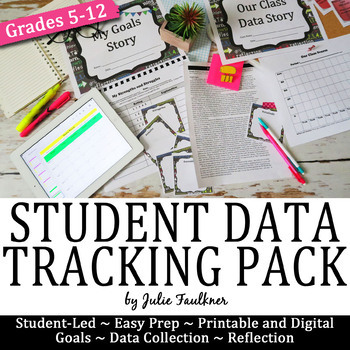 Get the new year started "on the right track" with this resource designed to help teachers help students learn to take ownership through setting goals, charting and tracking data, and reflecting on their progress and growth. The most unique aspect of this pack is that the information that students chart in their portfolios throughout the year stems from authentic data fostered and earned right inside the classroom. I have used these charts and reflection techniques in my classroom for years, and I do believe it is has been one of the best practices I have ever done. No matter what age or academic level of the student, time spent reflecting on learning and growth can be incredibly powerful. 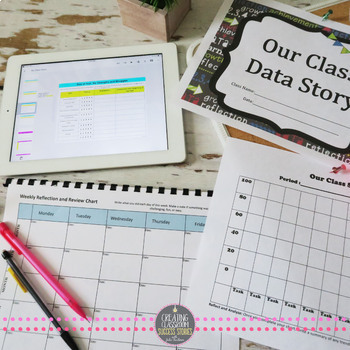 Help your students get started writing their data story today! Great for RTI, parent night, student portfolios, teacher evals, bell ringers, test prep, new year resolutions and more! Use it all or just what you need. ♥ "Best ever! Thanks Julie for providing this resource. I used several pieces of it with my 7th graders this fall during student-led conferences. "My data story" for covers of portfolios and parents commented on how cool they looked. Students loved the "sticky" notes for annotating their work. They also love tracking their writing progress on the data tracker. The self-evaluation was a great conversation starter. 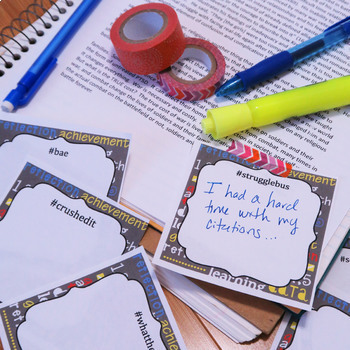 For the first time ever, conferences were a celebration of student accomplishment. Thank you for putting it all nonce place and for making it look so good." ♥ "You are helping me out so much with my new grade placement. Thank you!! This resource will be an excellent way for the students to track their own progress and reflect on their goals set. I've just discovered your blog and am anxious to head over there. Thanks for sharing so much with us! You ROCK!" ♥ "Perfect for use with Marzano." If you teach grammar, check out my daily grammar program with weekly grammar quizzes, which are a perfect resource for collecting data! It's Just a Click Away! If you teach writing, check out my weekly prompts for short writing tasks, which are also a perfect resource for collecting data! It's Just a Click Away!